I had never participated in Winter Field Day before. However, I had always liked the idea as I love the ARRL June Field Day. The WFD event is newly sponsored by the Winter Field Day Association. It turns out this year's date coincided with a rocket launch in Samson Alabama. So I scoped my WFD down to operating during the launch that gave me a four hour window. 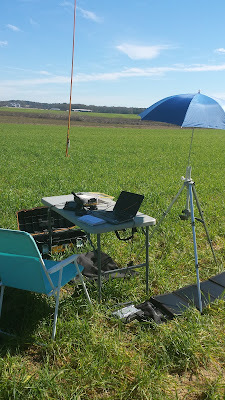 Conditions were great for launching rockets and operating the radio. The high was 68 degrees Fahrenheit, no precipitation and sunny skies. That does not feel like Winter. John and Micky watch rockets from my Winter Field day setup in the background. I chose to operate my Icom 7100 on battery. I was testing the Chameleon Windom 40 off center fed dipole. I deployed it relatively flat by using four supports. I am finding that the SWR curve is better with the OCF flat rather than inverted vee. This applies to another OCF I also own. 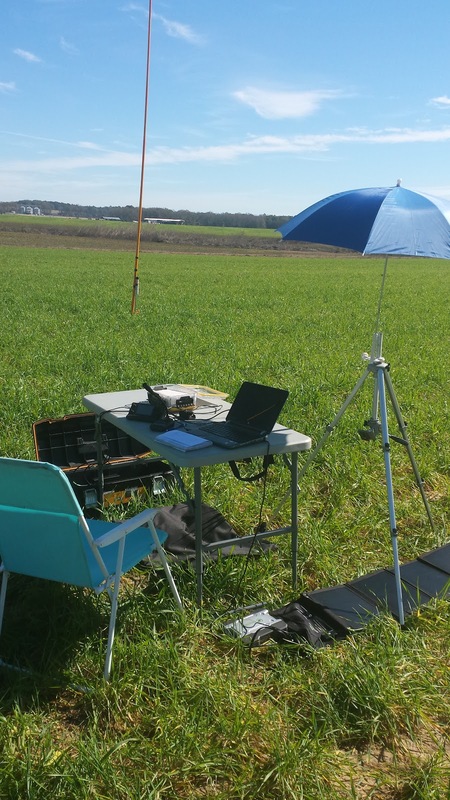 I also tested out doing computer logging on the field. Any time I combine computers and ham radio it is challenging. I discovered that N3FJP Software had a logging program specific to Winter Field day. That program works well and I could see the screen good enough to get the job done. I powered the laptop with a Bioenno power pack. The power pack has an inverter built in. I plugged the laptop into the AC out. On top of that the power pack has a built in solar controller. So I used the Bioenno 28 watt solar panel to charge the power pack. This was good training for computer logging during a a full Field Day. The operating table with the laptop for logging. Notice the Bioenno power pack and solar panel. I did not know just how many stations would participate in WFD. I was pleased to find plenty of activity mainly on 20 meters although there was some on 40 meters as well. I worked 29 stations in the event. I had some help from WB4BLX, W5RE, WD0HBR, K4LIX and W8JER who I know personally. John W8JER and Micky KE8ASK joined me at the launch. They are regulars at the launches during the Winter as they spend the Winter in Panama City instead of their Michigan home QTH. Now add on to this that there was a huge crowd at the launch. 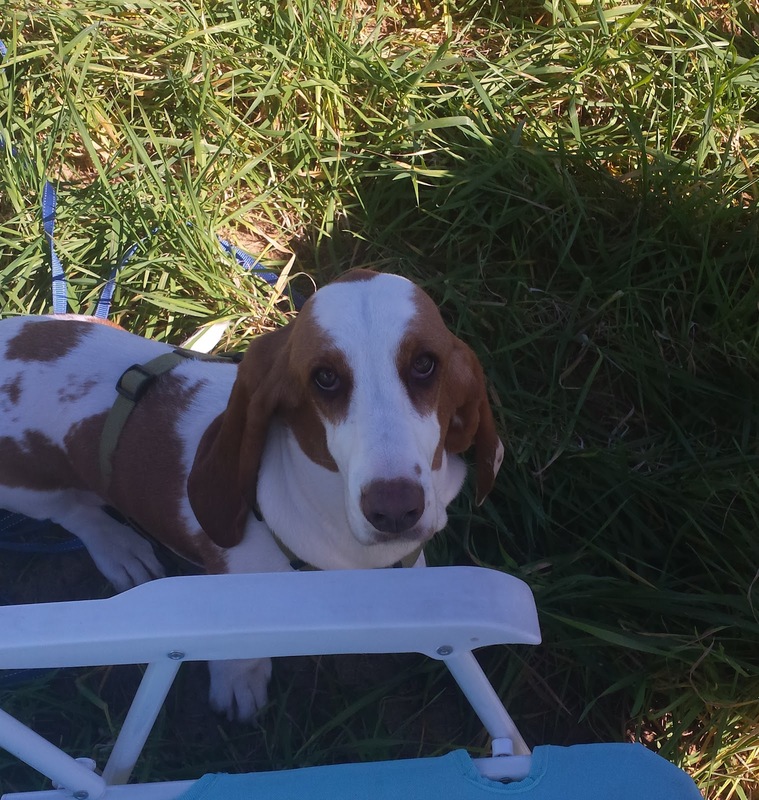 I brought Suzy our Basset. 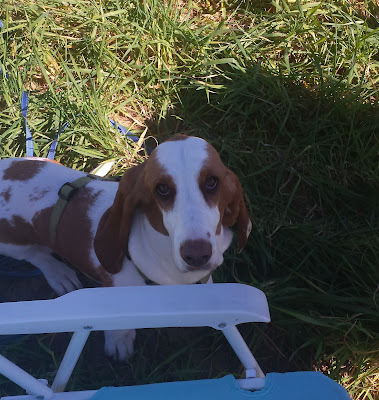 Suzy was spooked by the first loud launch but she got comfortable with it as the day went on. She loves meeting new people and of course it is mutual. She gets lot of petting and belly rubs. My only launch was a 18 inch saucer rocket on an I280 Metal Storm motor. Notice the sparks. 18 inch saucer rocket launch with a Metal Storm motor.